Today, the Going Green Genesis Child Theme was updated to version 3.0. Its a beautiful update packed with 4 color options (Default, Forest, Mint, and Olive) and support for the Genesis 2.0 goodies. Getting the stock setup online, took no time at all, thanks to the simple setup steps (Login Required) StudioPress provides. 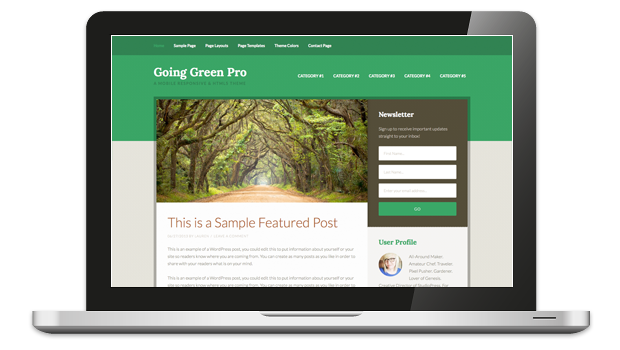 I dare say, green bloggers are going to make a bunch of folks green with envy by using this beautiful Genesis Child Theme to showcase their content. What about non-bloggers, who need more of a CMS styled home page for their website? I have a Forest Management client that this theme would be perfect for, other than the blog page being his home page. For those that own Catalyst, StudioPress created a 50% off discount code, which was originally set to expire today at 5PM PT. The StudioPress folks have extended the discount for an additional week and will now expire next Friday, August, 2, 2013. You will find the discount link on your My Account page, located in the top right navbar of Cobalt Apps. If you have any issues while making your purchase of the Genesis Framework, please contact StudioPress Support and they will get you taken care of as soon as possible. Another post covered creating your custom home page, so this post will work through creating a custom secondary page, specifically a staff page. If you’re like me, you’ve been drooling over the latest refresh by Team Gardner/Tomal. In this post, we’ll add an affiliate Box using the Extender Plugin for Genesis. Scroll to the bottom of this post, or any post on this website, to see the affiliate box in action. If you haven’t already, be sure to sign up for the Genesis Extender Affiliate Program, so when you add this affiliate box to your website(s), you can make 40% ($17.60) when visitors click your affiliate link and then decides to buy the Extender Plugin for Genesis. Three out of every two people on earth visit Facebook each day. Thats only a mild exaggeration, the point is that many people use Facebook, so it just makes sense to have your website cozy up to Facebook. This is separate from creating a Facebook Fan Page, like ours for Dynamik Website Builder, for your small business or non-profit organization.